Coast Defense Ship Probeda. IWM photograph Q 22446. Coast Defense Ship General Admiral Graf Apraksin. Photograph from "History of Russian/Soviet Battleships". This weapon was a joint Army/Navy project. The Navy version was too lightly constructed and hence suffered from weak barrels and poor ballistic qualities. The Army weapon was a heavier design with good ballistic qualities, but had very primitive mounts that restricted their rate of fire. 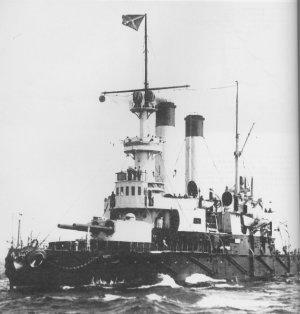 By 1901, OSZ had delivered 30 guns of which 27 were installed on ships. 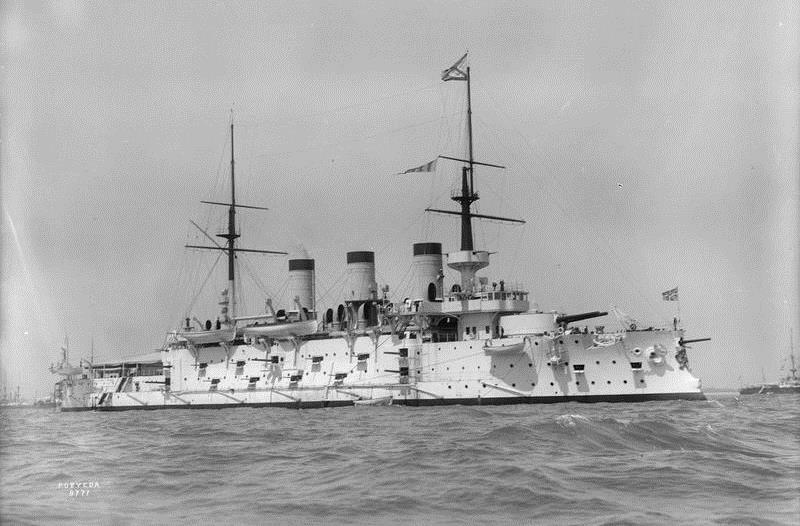 By 1917 there were only ten guns on hand on Naval Ministry charts, of which four were installed in the battleship Rostslav. The Army had a large number these guns in coastal batteries, including one battery of five guns at Port Arthur in 1904 and another in the Moonzund area in 1917. These guns were the main coast defense weapons of the Russian Navy from 1892 to 1914. The Russian pre-dreadnoughts Admiral Senyavin and General-Admiral Apraksin were captured following the Battle of Tsushima (Battle of the Japan Sea) and became the Japanese Mishima and Okinoshima. It should be mentioned that these maximum ranges were of little use at the time these ships were built. Fire control systems and rangefinders capable of accurately firing at ranges over 10,000 yards (9,140 m) were nonexistent. ^This is the range for Pobeda's guns with a muzzle velocity of 2,549 fps (777 mps). Armor Penetration with 496.5 lbs. (225.2 kg) AP "old model"
Data for guns on Pobeda with a muzzle velocity of 2,549 fps (777 mps) vs. KC-type Armor.